Angus is appearing at the 2018 Woodford Folk Festival from 29th Dec-1st January. Head over to woodfordfolkfestival.com to book your tickets now. Wauchope’s Angus Gill is establishing his place as one of the top rising country music artists in Australia. 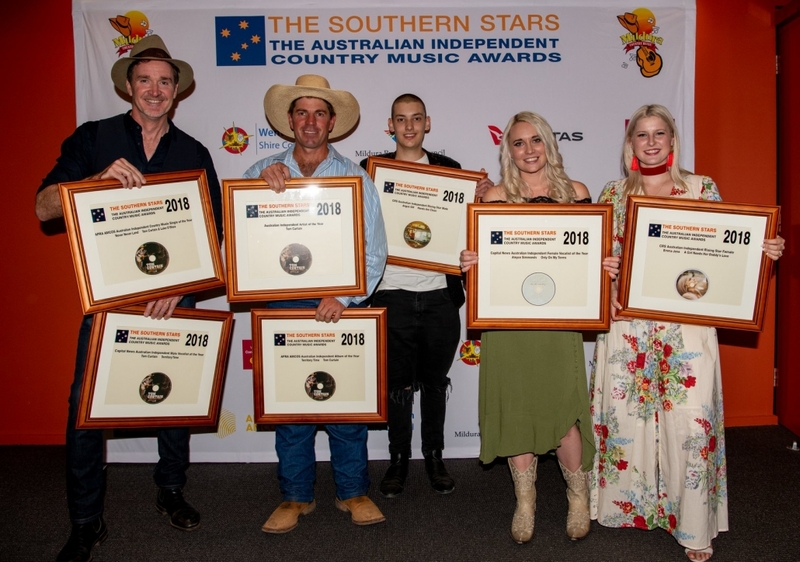 The singer/songwriter and producer took out the coveted Male Rising Star award for his single Hands are Clean at the annual Southern Stars Australian Independent Country Music Awards, held in Mildura. Gill has recently returned from a two month songwriting trip to Nashville, hanging out with music legends Vince Gill, Steve Earle, Rodney Crowell, Bernie Taupin (Elton John), Ray Stevens and collaborating with Music Row’s best hitmakers Bob DiPiero (Tim McGraw, Faith Hill, Garth Brooks), Jeffrey Steele (Rascal Flatts, Keith Urban), Terry McBride (Brooks & Dunn, Reba McEntire) and more. 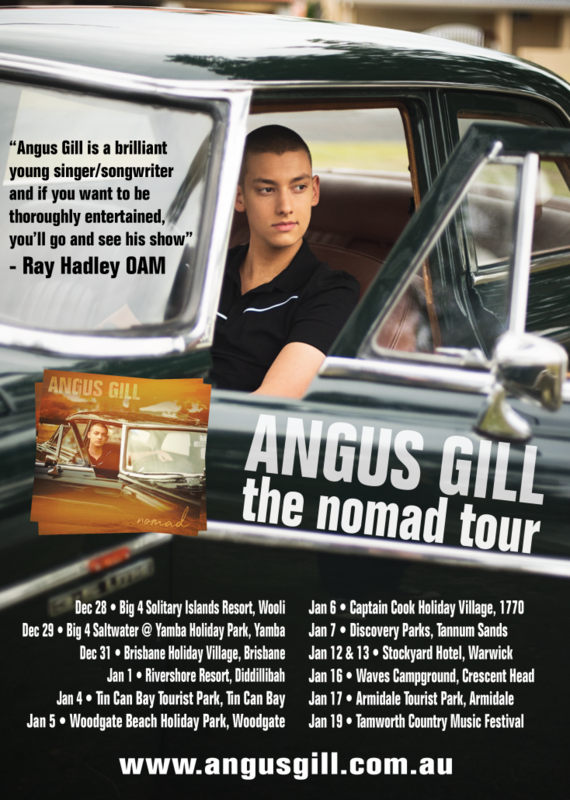 Rising country singer/songwriter ANGUS GILL is pleased to present an upcoming tour, following the successful release of his debut album NOMAD. At 20 years of age, Angus Gill’s songwriting themes and vocals are mature beyond his years. His live show is a dynamic collection of catchy, humorous and poignant songs to make you laugh, cry and think. Gill’s debut album NOMAD, has rapidly began to cement him in the hearts and minds of Australian country music fans, peaking at #13 on the ARIA Country Albums Chart. This is an album that is deeply rooted in pure country with an overarching theme of journeys and a smattering of his trademark brand of humour, making it the perfect roadtrip companion. Not only has he co-written all the songs with the cream of the crop of the Australian country music scene, including ADAM HARVEY, GINA JEFFREYS, LUKE O’SHEA and KEVIN BENNETT, Gill has also produced all 13 tracks on this debut album. When Angus hits the road in his trusty RV, audiences are in for a surprise. Roadworks, police officers, p plater drivers, small towns and nomads…they’re all being covered during this highly entertaining and intimate 75 minute show. “I couldn’t be happier to bring my songs and stories to the people that can relate to them the most…the travellers. I’m looking forward to taking them on a journey throughout the evening, hearing about their travel experiences and in turn, hopefully gathering inspiration for Nomad volume 2,” laughs GILL. 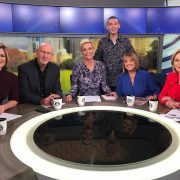 Angus has recently appeared on Channel 10’s flagship morning talk show Studio 10 with Sarah Harris, Jessica Rowe, Ita Buttrose, Denise Drysdale and Peter Berner. He performed his new single Roadworks and had a chat with the panel about his new album Nomad. 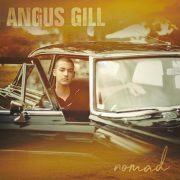 THE latest release from singer-songwriter Angus Gill, Nomad, is the ultimate roadtrip companion with every track related to journeys and travel. 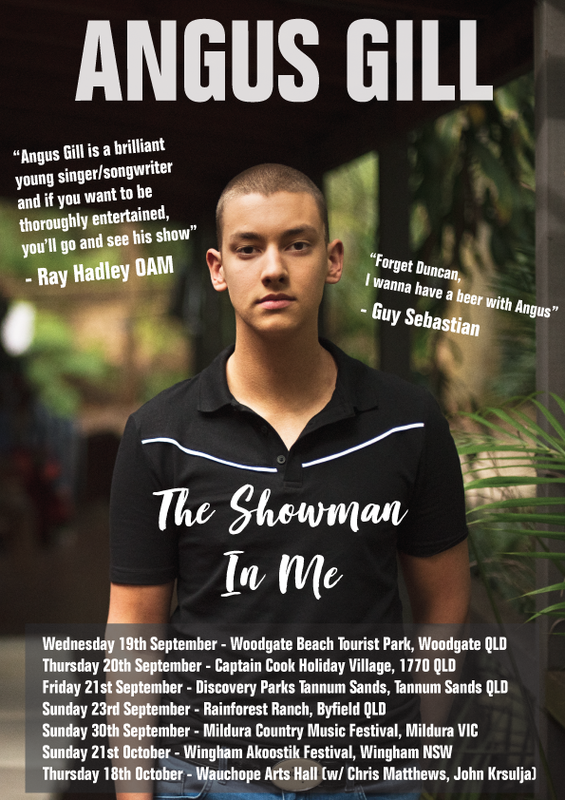 Having already garnered support for his debut album with the release of the first single, Roadworks – a tongue-in-cheek look at the way roadworks slow down our journeys in life and on the road, Nomad will cement him in the hearts and minds of Australian country music fans. The singer-songwriter said he wanted listeners to take his music along for their roadtrips and gain an insight into his writing process as well. Although he hasn’t even reached the age of 20, Gill’s songwriting themes and vocals are mature beyond his years. This is an album that is deeply rooted in pure country with a smattering of his trademark brand of humour. “I want to get out and take this album to the corners of our country, to the people that can relate to every word and come back with material for the next album,” he said. 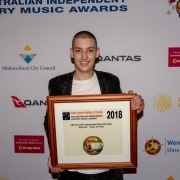 The 19-year-old has not only co-written all the songs with the cream of the crop of the Australian country music scene, including Adam Harvey, Gina Jeffreys, Luke O’Shea and Kevin Bennett, he has also produced all 13 tracks on this debut album at his Hot Plate Studios in Wauchope. 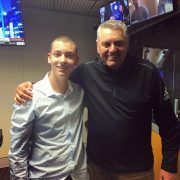 The album features Angus teaming up with Kevin Bennett and Amos Morris on Staring Out The Back of a Car dealing with the tragedy of the Stolen Generation and he duets with Adam Harvey on P Plater, a track dealing with the realities of young drivers combining Angus and Adam’s senses of humour. 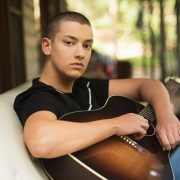 Angus was a grand finalist in the prestigious 2017 Toyota Star Maker competition and is a three-time CMAA Academy of Country Music graduate. He is available for interviews to chat about the new album and his upcoming tour plans. Nomad is released September 15 through Checked Label Services. 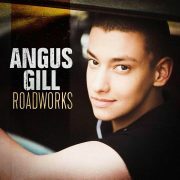 AUSTRALIAN radio is digging Angus Gill’s new single, Roadworks, charting at No. 6 on the AMRAP Regional Chart, No. 11 on the Country Tracks Charts and the 13th most downloaded track on Play MPE. From his upcoming album, Nomad, Roadworks is as relevant to those who’ve been stuck at a stop/slow sign as to those who know the feeling of enjoying life before hitting complications that slow you down or delay your journey. 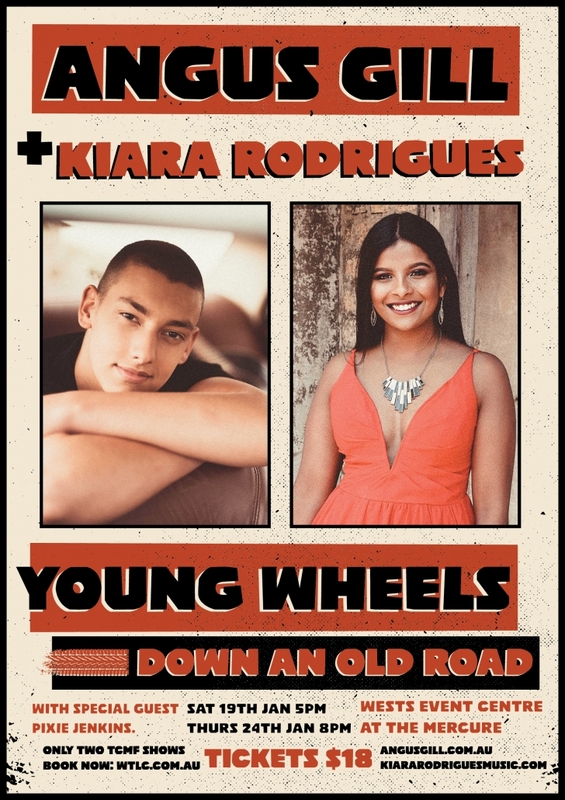 The young Mid North Coast of NSW singer songwriter wrote the song with Matt Scullion on his first trip to Nashville in July 2015 after wanting to theme the album around roads. Angus brainstormed ideas for songs on a mind map, and the premise for Roadworks was born. Along with the message of the song, the music also speeds up and slows down just as roadworks do to a driver’s journey, so was recorded live in the studio with all players following each other. “It was a challenging song to record, as the musicians couldn’t play to a click track because of the tempo changes, but that’s what made it all the more fun,” Angus said. Getting in the theme of the song, Angus is often seen performing Roadworks dressed in high-visibility work wear and the occasional hard hat. The track also featured at this year’s Toyota Star Maker Grand Final where Angus performed in full high-vis outfit and it proved a Tamworth crowd favourite. Angus also produced and mixed the album in his Wauchope based production suite Hot Plate Studios. Roadworks features Stuie French on electric guitar, Camille Te Nahu and Matt Scullion on backing vocals Clayton Doley on Hammond B3 organ, Bill Risby on piano, Pete Denahy on fiddle, Ian Lees on bass and Brad Bergen on drums. Returning to Tamworth in July this year, Angus shot the film clip for the single with 2 Lukes Films supported by local businesses Men At Work, Hilberts Hardware and Kazac Civil who assisted with props and, of course, the all-important high-vis work wear. The film clip is released on August 18. HAVE you ever felt that your life resembles roadworks? If so, country artist Angus Gill’s latest single is just the song for you. From his upcoming album, Nomad, Roadworks is as relevant to those who’ve been stuck at a stop/slow sign as to those who know the feeling of enjoying life and then hitting complications that slow you down or delay your journey. 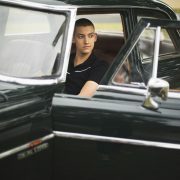 The young Mid North Coast of NSW singer-songwriter wrote the song with Matt Scullion on his first trip to Nashville in July 2015 after wanting to theme the album around roads. Angus brainstormed ideas for songs on a mind map, and the premise for Roadworks was born. Returning to Tamworth in July this year, Angus shot the film clip for the single with 2 Lukes Films supported by local businesses Men At Work, Hilberts and Kazac Civil who assisted with props and, of course, the all-important high-vis work wear. Roadworks is released on August 11 from the ultimate roadtrip album, Nomad, to be released on September 22, distributed by Checked Label Services. Angus is available for interviews to chat about the single and album.